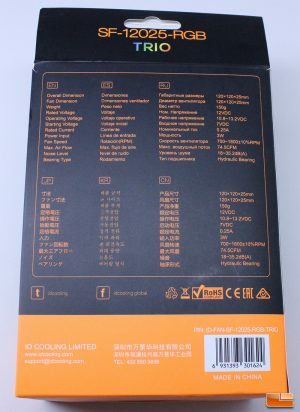 ID-Cooling is a relatively new company that our readers may not have heard of before, first debuting at Computex 2013, but their parent company has been doing OEM cooling design and supplying major manufacturers like Cisco, Huawai, Lenovo and more for years. Legit Reviews was contacted by ID-Cooling during CES 2018 and asked if we would like to cover their products, which are aimed at the value PC enthusiast segment. 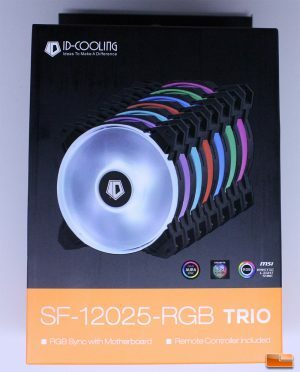 We always like to bring our readers coverage of products that may be of interest, so we had ID-Cooling send over their latest fans, the SF-12025-RGB Trio Kit. Known players in the PC enthusiast industry like Corsair and NZXT already offer a variety of high quality RGB fans, but these offerings tend to be on the more expensive side of the value spectrum and require controller boxes paired with proprietary software to run properly. Don’t get me wrong, I like my Corsair LL and ML RGB series fans that can be controlled through Corsair Link, but those cost over $30 per fan and require a Corsair Lighting Node Pro, putting them in a premium price category that many users simply can’t afford to invest in. By the time you load out your system with three Corsair LL or ML series fans, you’re spending over $100. If you’re building a basic gaming system on a few hundred dollar budget, a load out of fans that cost 20% of the system makes little to no sense. Does that mean that users on tight budgets should be excluded from the glorious world that is RGB fans? Not necessarily. 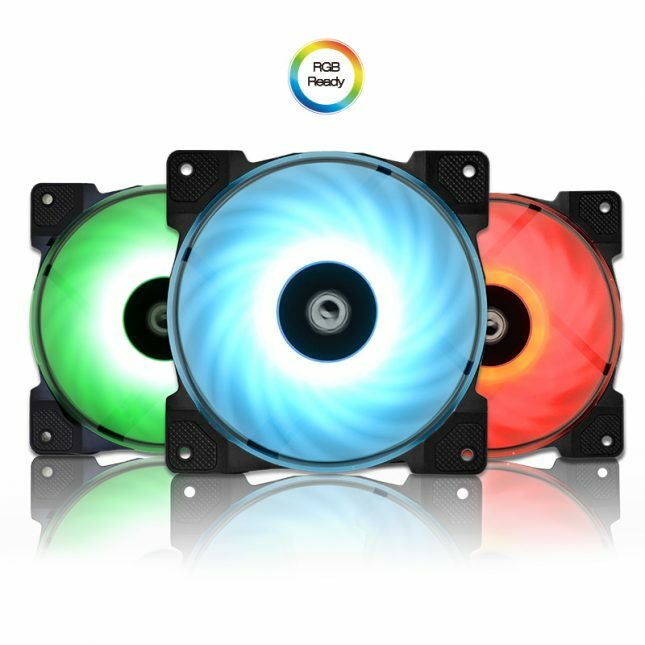 The ID-Cooling SF-12025-RGB Trio Fan Kit takes a break from the expensive RGB party and brings consumers a set of three 120MM RGB fans with remote control capabilities, all for under $45 shipped. Along with offering compatibility with the popular motherboard RGB control software on the market like Asus Aura Sync and Gigabyte RGB Fusion, the SF-12025-RGB Trio Fan Kit also includes a remote control and compact receiver to allow for wireless control over your PC fan lighting. 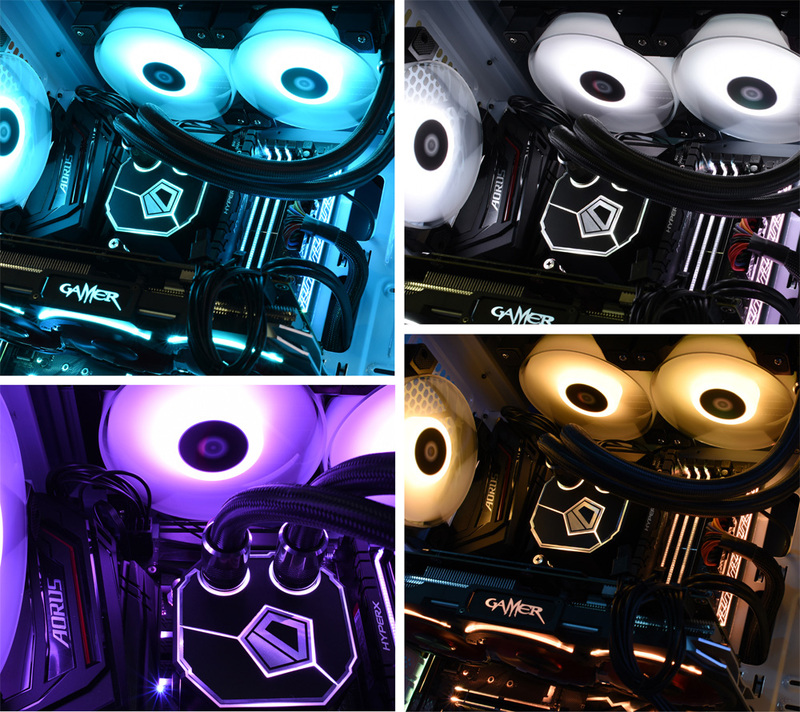 Does the ID-Cooling 120MM RGB Trio kit bring great value to users looking for some decent performing fans with RGB lighting, or does ID-Cooling try to reach too hard with their value proposition and fall flat? The ID-Cooling 120MM SF-12025-RGB fans have been specified to operate in the 700-1800 RPM range, topping out at 74.5 CFM with a 35.2 dbA noise rating. The static pressure rating of the ID-Cooling SF-12025-RGB fans is 1.82mm H2O, which isn’t an extremely high rating, but respectable enough that these fans should be acceptable for use on radiators in non-extreme applications. ID-Cooling states that the SF-12025-RGB Trio utilizes a hydraulic bearing, which tend to perform better than their sleeve and ball counterparts, though bearing quality can vary and the type of bearing isn’t an automatic indicator of quality. 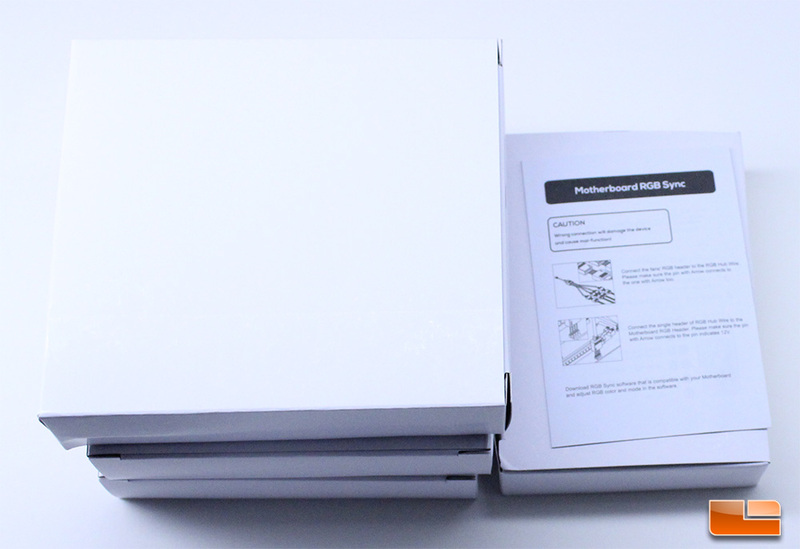 The ID-Cooling SF-12025-RGB Trio Kit ships in a black and orange box constructed from a fairly thin card stock. An image of several of the ID-Colling SF fans lined up in succession with different colors of lighting is on front of the box. Logos noting support for popular motherboard RGB control programs that the RGB Trio Kit is compatible with are also on the box. A quick check of the rear of the ID-Cooling RGB Trio box reveals specifications for the fans in several different languages. Opening the ID-Cooling SF-12025-RGB Trio Kit unveils four boxes, three of which each contain a fan, while the accessories for the fans are packaged in their own box, within separate bags. An informative user guide is included with the ID-Cooling RGB Trio Kit, which includes illustrations and guides for installing the fans in different configurations. The receiver and controller module for the SF-12025-RGB Trio Kit is compact and easy to install, only requiring a SATA power connection. The receiver control module isn’t necessary if you are going to be controlling the ID-Cooling SF-12025-RGB fans directly from your motherboard, but even in those scenarios I can see users wanting to use the included remote control and receiver for quick and easy control of their lighting. The four pin connector of the receiver has been properly labeled for the 12V-G-R-B pins. 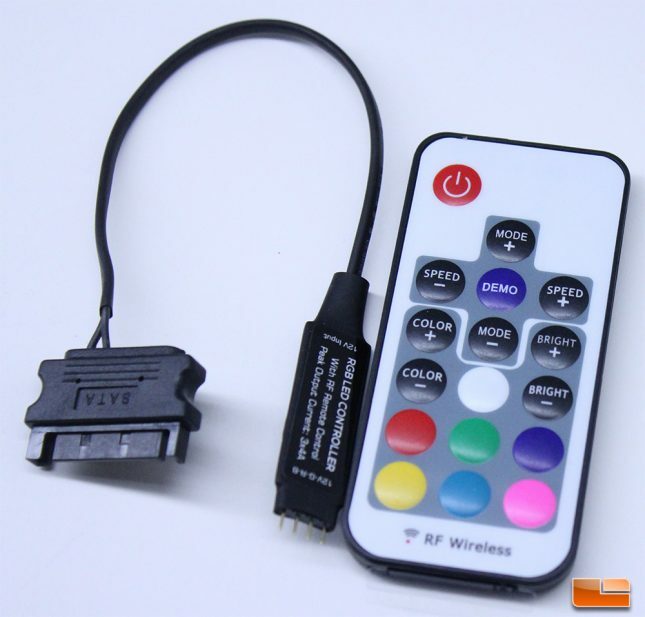 The remote control that is included with the ID-Cooling SF-12025-RGB Trio Kit is small and compact, with the various functions spelled out on the face in an easy to read font. 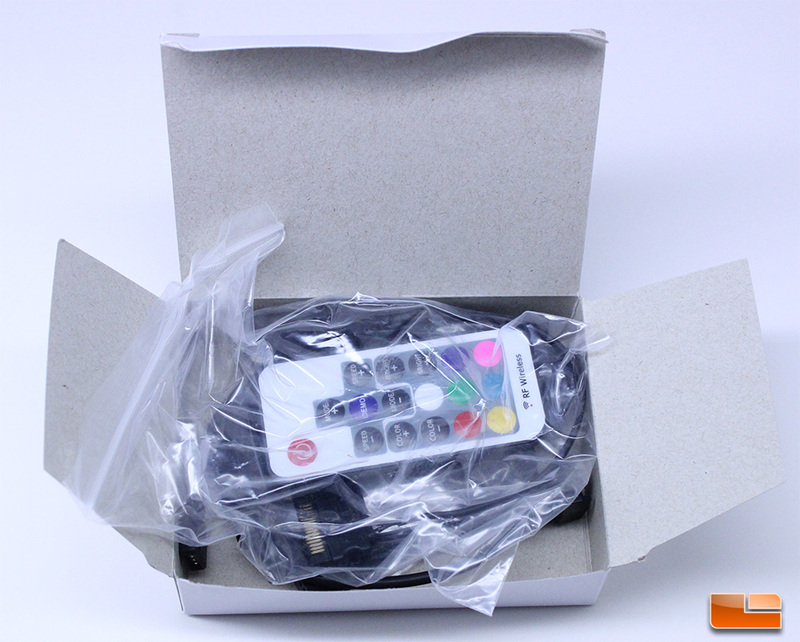 The remote control only controls lighting function, RPM control is still handled by the motherboard or fan controller that you hook up the fans to. 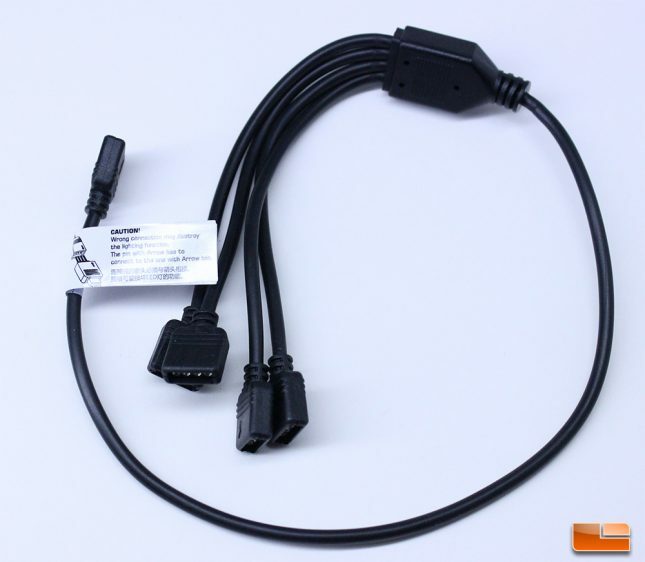 ID-Cooling includes an RGB lighting cable with four female connectors so that each fan can connect directly to the controller or motherboard with a single connection, rather than requiring RGB headers for multiple fans. 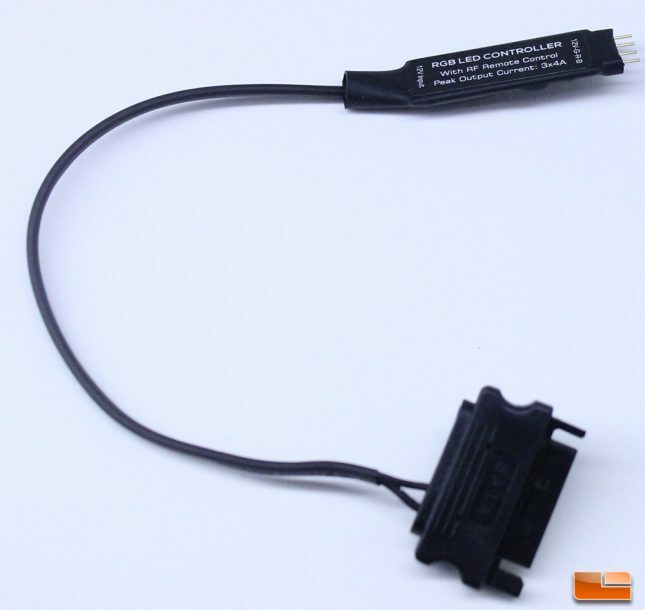 ID-Cooling includes a cable that will let customers use a single three-pin fan cable connection to power each of the SF-12025-RGB fans in the kit, as well. 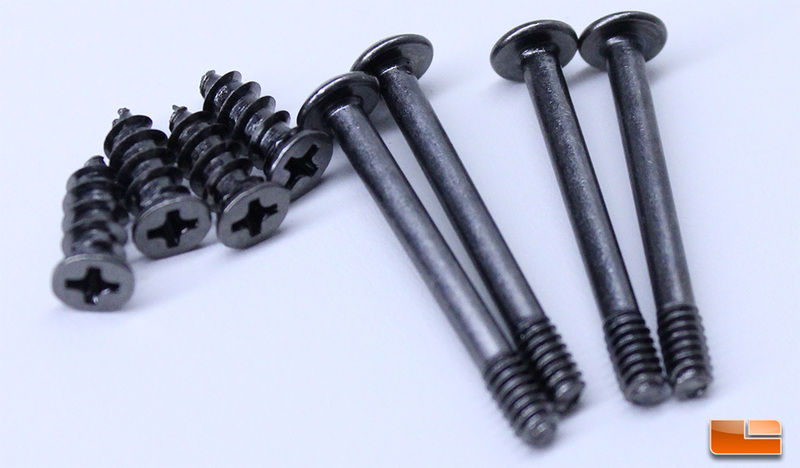 Rounding out the accessory kit, ID-Cooling includes both long and short screws so that the SF-12025-RGB fans can be mounted in exhaust or intake mode. ID-Cooling has done a good job of rounding out the accessories in their SF-12025-RGB Trio Kit, as it includes everything you’re going to need to get started across a variety of systems, including those with motherboards without built-in LED headers. Let’s take a closer look at the SF-12025-RGB fans, next.